Upstream oil and gas analytics are in high demand around the world. At the same time, this market’s current growth rate can be heavily attributed to the falling oil and gas prices. The overproduction of crude has convinced most oil and gas players to adopt improved solutions in analytics. Midstream and downstream oil and gas analytics are showing a more diverse growth rate due to varying demands across regions. The former is progressing at the second-fastest rate, while the latter is in high demand across regions that need better corporate functions and refining processes. For instance, Europe has shown a higher growth rate for downstream oil and gas analytics than for midstream, as opposed to several other regions. The North America oil and gas analytics market was already leading in 2015, when it held a revenue share of US$3.1 bn, which was 45% of the market. A majority of this share was held by the U.S. due to its currently high progress rate in oil and gas exploration and production. North America is also one of the regions where the oil price slump has hit the hardest and has been a major enabler of analytics implementation. This region is showing a major demand in upstream analytics, due to a rapid increase in exploration and production of unconventional oil and shale gas. The Europe oil and gas analytics scenario is expected to take a hit from the tightening regulations regarding renewable energy reforms. The current energy targets applicable to the E.U. are expected to restrain the growth of oil and gas analytics in this region. For now, most of the region’s demand arises from its highly complex network of oil and gas pipelines. As for the Asia Pacific oil and gas analytics, a rapidly strengthening IT industry is gaining dependence from the region’s oil and gas sector. This link is boosting the interest of global players on the Asia Pacific region, allowing a much higher success rate for key player market penetration. Similar trends apply to the massive oil and gas industry in the MEA region, where Saudi Arabia, the UAE, and South Africa are the top locations in this region. Rapid growth rates can be expected in all application segments of the global oil and gas analytics market. This holds true especially for the upstream analytics segment, which already led the market in 2015 with a 52.9% market share. It is showing the fastest growth rate with respect to mid-stream and downstream analytics. The other two segments are not too far behind in terms of growth rates, but hold much smaller shares in terms of current revenues. The key factor responsible for the high proliferation of upstream analytics is the importance that the clients themselves are giving to upstream processes. These include exploration operations optimization, asset maintenance, drilling optimization, and risk assessment. All these applications find high priority of analysis and resolution in many oil and gas environments, making upstream analytics factor in much higher on the priority list. Upstream analytics have not only been the leading application segment for 2015, but it is also expected to be the leading segment till the end of 2024. It was recorded at a market value of US$3.66 bn in 2015 and will continue to hold a high priority in improving the exploration and extraction of oil and gas. The oil & gas analytics market report by Transparency Market Research provides in-depth analysis of the oil & gas analytics market globally. The report segments the market on the basis of application and geography. The report analyzes the global oil & gas analytics market in terms of revenue (US$ Mn) for the 2016–2024 period. For this research study, the base year is 2015, whereas the forecast is from 2016 to 2024. The report provides a comprehensive competitive landscape and features companies developing and providing oil & gas analytics services. This report includes the key market dynamics affecting the oil & gas analytics market globally. The analysis in the report provides detailed insights into the global oil & gas analytics market. Major dynamics such as drivers, opportunities, and restraints of the market were analyzed in detail and are illustrated in the report through tables. The report also provides a detailed analysis of the global oil & gas analytics market with the help of Porter’s Five Forces model. Oil & gas analytics services aid in minimizing the risks and improving safety across all the processes in the oil & gas industry. Oil & gas production output can also be enhanced with the assistance of oil & gas analytics services. Oil & gas analytics can also be used for assessing risky operations, and preventive measures can be undertaken to avoid accidents. Oil & gas analytics provides insights into logistics and supply chain and optimizes processes with integration of data across the entire supply chain. Oil & gas analytics also aids in monitoring of market sentiment, including potential opportunities, brand health, and competitor information. Declining oil & gas prices have encouraged adoption of oil & gas analytics services in the oil & gas industry. Increasing production from unconventional oil & gas resources has also boosted the adoption of oil & gas analytics services. 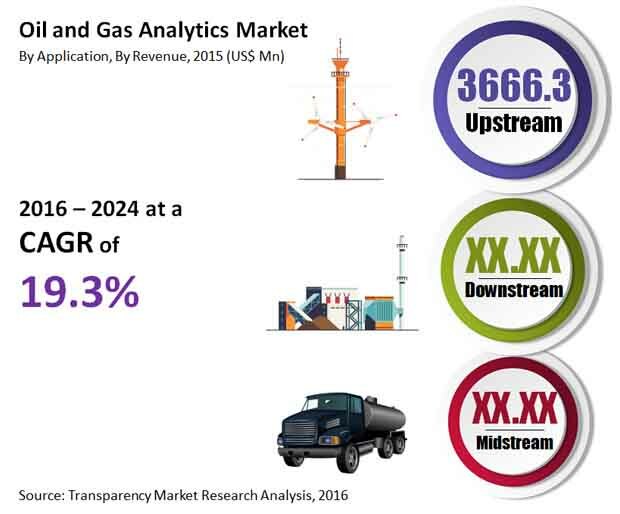 The global oil & gas analytics market has been broadly segmented on the basis of application into upstream, midstream, and downstream. Upstream application was the largest application segment of the global oil & gas analytics market, accounting for more than 50% of the global share in 2015. Adoption of oil & gas analytics services in upstream application has increased owing to rising drilling and production costs and associated risks. Upstream application segment includes oil & gas analytics services such as asset maintenance, exploration and production optimization, risk and Health, Safety & Environment (H&SE) management, drilling optimization, and finance commissioning assessment. Midstream application segment includes oil & gas analytics services such as transportation optimization (vessels and ships), supply chain management, pipeline risk assessment, and storage optimization. Downstream application segment includes oil & gas analytics services such as refining and separation processes optimization, liquefaction and regasification assessment, demand and supply optimization, trade optimization, price optimization, risk management, personnel safety assessment, market analysis, and marketing and sales assessment. The downstream application segment is expected to grow at a fast rate during the forecast period owing to increasing utilization in refineries and corporate functions. The global oil & gas analytics market was analyzed for North America, Europe, Asia Pacific, Middle East & Africa, and South & Central America. North America accounted for more than 40% of the global market share in 2015. However, the Middle East and Africa (MEA) oil & gas analytics market is expected to grow at the fastest rate during the forecast period. Asia Pacific is anticipated to be the second-fastest growing market for oil & gas analytics services. Europe, Asia Pacific, and Middle East & Africa held the second-largest, third-largest and fourth-largest market share, respectively, of the global oil & gas analytics market in 2015.